Pascal's Ghosts: How Many Ghosts Do You See? encourages students to apply the patterns in Pascal's Triangle. A teacher instructional plan with mathematical background, answer and challenge is included to explain how to present this problem which is also an outgrowth of the Rutgers Discrete Math Institute. A recording sheet was also included as part of the teacher packet so that students are able to record all different solutions in a "systematic" way, which is a goal of discrete mathematics. 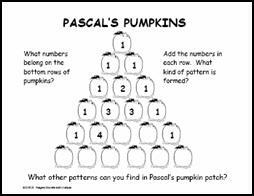 Pascal's Bats challenges students to identify and use the patterns in Pascal's Triangle to complete the unfinished row and to add the next row to the pattern. 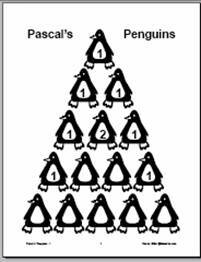 Pascal's Penguins - 1 introduces primary students to a small version of Pascal's Triangle in this simple patterning activity. Pascal's Penguins - 2 introduces a larger version of Pascal's triangle and encourages students to identify the different patterns within the triangle and use these patterns to fill in the missing penguin numbers. Pascal's Hearts introduces students to Pascal's Triangle in this simple Valentine's Day patterning activity. Shamrock Paths introduces students to Pascal's Triangle in this simple St. Patrick's Day patterning activity. Houses in a Row challenges students to figure out how many different color combinations are possible for a row of houses, if no two houses can be painted exactly alike. Use large color squares and triangles to model this problem for students as an introduction to combinations. Stoplights challenges students to figure out how many different stoplights they can create with 3 different color linking cubes if each stoplight must have one cube of each color. Use linking cubes so that students can assemble all possible stoplights. You may choose to have students use any three different colors so that each student pair has enough linking cubes to assemble all possible combinations using one of each color to create the stoplight. Spider Web Map Coloring Games: this 2-4 player game challenges students to apply map coloring rules to win the most points by coloring in sections of the spider web on each dice toss. Students toss a special die (1-1-1-2-2-lose turn) to find out how many sections they may color in on that turn. The game ends when no player can color another section according to map coloring rules. Data Investigations: Codemaking and Codebreaking: this page investigates mathematical codes and features links to historical and current applications of mathematical codemaking and codebreaking. 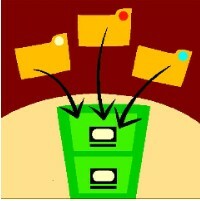 This is a critical issue for the security of information sent via e-mail or the internet. 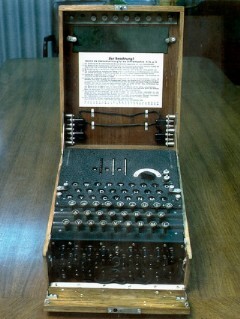 The page also contains "Crypto Lists" which challenge students to analyze letter frequency to decode these related lists. 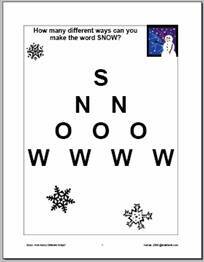 See more Discrete Math Templates: insert in sheet protectors for student use with dry erase markers or for teacher use as overhead transparencies. See Problem Solving Resources for open-ended assessments that involve discrete math. See all Discrete Math & Logic Games. See more Discrete Math Links. See all Enrichment Activities for discrete math.